Do you know if you don’t spell “coffeeneuring” regularly, that it becomes very difficult to spell? The same is true of the practice of coffeeneuring. If you don’t ride your bike to coffee regularly, it is soon a lost art to the individual. 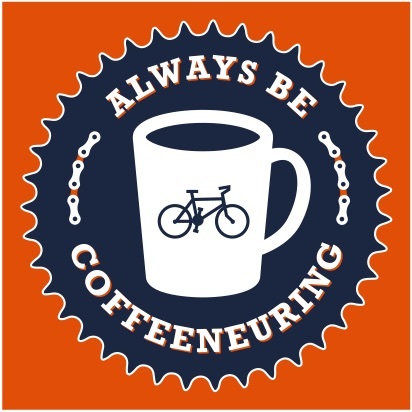 That’s why it’s important to Always Be Coffeeneuring (patch coming soon, courtesy of umbrella-works design stay tuned!). Recently I’ve had the pleasure of talking with several members of the Always Be Coffeeneuring club, including today’s feature with Jay of Frederick, Maryland. Jay became the first official Coffeeneuring Challenge finisher out of Frederick, Maryland, and completed the challenge in quite a creative way – by choosing coffee shops without walls and using different brewing methods for each outing. Jay’s fine photo captures of his experience further conveyed his affection for bikes, coffee, and the great outdoors. All photos in this post are his. Some of you may know Jay, as he is a friend of the Gravel & Grind shop in Frederick, Maryland – an enterprise where beautiful bikes meet good coffee and other treats. If you haven’t been, it’s well worth the visit. In the meantime, below is a more in-depth look at Jay’s coffeeneuring, and helpful tips for making coffeeoutside part of your bikes plus coffee routine. Thanks to Jay for the beautiful images and thoughtful guest post. Congratulations on being the first Coffeeneuring Challenge finisher from Frederick, Maryland! What appealed to you about the challenge? The “Coffee Shop Without Walls” category drew me into it. I’d been doing coffee outside rides for some time before knowing there was a name for it. I was stoked to find a bunch of like-minded people on Instagram, and through one of them I stumbled upon your blog and the Coffeeneuring Challenge. You were one of several who took on the “theme within a theme,” and you chose a different brewing method for your seven coffee outings, all of which were coffee outside (or coffee shops without walls, in coffeeneuring terms). Coffee outside seems to have special significance to you. What makes the coffee outside experience special, say, when compared to going to a shop or preparing your coffee at home? There is something therapeutic about making coffee in the woods. Coffee making in and of itself is a ritualistic process and to experience it outside in nature is almost meditative and calming. Coffee outside provides destination to my rides. It gives me the opportunity to slow down, take a break, explore the surroundings, and take photos. The coffee may not always be on par with one made at home or at the shop but the experience always makes for good memories. You used seven different brewing methods to complete the Coffeeneuring Challenge. I found it impressive that you have so many setups! Of all the different methods you used, what are your preferred coffee outside setups, and why? I purposely got the Aeropress for coffee outside rides. It works great because it takes the guesswork out of how much water to use. I get the same quality cup every time. I use a gram scale at home to measure the amount of water when making pour over coffee, but that would seem out of place in the wild. My small grinder fits neatly into the Aeropress plunger, so the whole kit takes less space in my bag. The Snow Peak dripper, which folds flat, is my favorite among the pour over methods because of its packability. Any recommendation on a coffee outside setup for a person who is just entering the coffee outside realm? I would definitely recommend the Aeropress for its ease of use. A portable grinder is good to have but it’s not necessary. You can pre-grind your coffee at home. Head out to your favorite camping outfitter for a backpacking stove and a pot and you’re all set. Better yet, if you’re in or around Frederick, Gravel & Grind has all the coffee outside gear you need. Not to mention, they have great coffee and Rivendell bikes to drool at. If you must have a grinder, the Porlex Mini is the one to get. Ceramic burrs, slim profile, stainless steel body, and very well made. Fresh coffee is always important. My husband is an espresso-only guy. Which setups works best for “espresso outside,” or is that really not possible? Is there any one that comes close to espresso? I’ve read about the Handpresso but I’ve never tried it so I don’t know first hand how well it performs. It generates pressure like a bike pump and works with fresh grounds. I notice you like to make use of the bandana for your coffee outside. Tablecloth? Cleanup? Presentation? What is the role of the bandana in coffee outside? All of the above! I always have at least two in my bag that I use as padding to keep stuff from clunking around. Fall is the best time for coffee outside and I always use a bandana as a placemat when I’m setting up on the ground to avoid losing stuff in all the leaves. It may seem like a small thing, but I’m particular about my traveling coffee cup. Currently, I’m using an Association of Caffeinated Wheelmen double-walled steel cup (currently not available, it appears). Do you have a favorite cup/mug for your coffee outside, and what is it? I don’t really have a favorite. In fact, I’m still in search for the perfect coffee outside mug. I will look into that Association of Caffeinated Wheelmen cup. I have a few enamel mugs that I use on rotation, but they don’t really retain heat very long and they chip easily when dropped. What heating setup do you generally use to boil the water for your coffee? I use a Trangia clone alcohol stove. It’s made by Esbit and came as a stove-stand-pot kit. I made a windscreen out of aluminum foil which works pretty well. This setup is light and compact, and the stove is very quiet. If I have extra space, or when I’m out of denatured alcohol, I would take my Kelly Kettle out on my outings. It’s a pretty neat stove that uses natural fuel and brings water to a boil very rapidly. Your photos are gorgeous, Jay. I asked Sarah, who I also recently interviewed about coffee outside, this question, and I’ll ask you, too. How do you set up the ideal coffeeneuring shot? Also, what camera do you use? I always look for good light and clean background. I have a Sony a6000 camera. It’s a small mirrorless camera with interchangeable lenses. I love the wide angle lens that came with it but one nice thing about mirrorless cameras is the ability to use old manual focus lenses through adapters. I’ve been shooting film for a long time until about two or maybe three years ago when all the camera shops in my area went out of business and the cost of film processing skyrocketed, so I’ve already got a bunch of manual focus lenses in my photo equipment arsenal. I have an adapter for Nikon F-mount and Leica M-mount lenses that I use a lot. Autofocus comes handy when taking pictures while on the bike, but I just love shooting with a manual lens in general. It allows me to slow down just like manual coffee brewing does. What bike did you use for your coffeeneuring trips? Looks like a Bridgestone, no? Tell me about it. I have a mid-80s Bridgestone touring bike that is setup for gravel road riding and bike camping. I was able to fit 38c tires with fenders, which is super rad. I kept the original 5 speed freewheel and paired it with a 44/26 wide range double cranks. The 26t granny gets me up most hills in Frederick county. It has a wide dirt drop handlebar that helps me muscle my way through rough dirt roads and technical singletrack. A handlebar bag, supported by a decaleur and a small rack, holds all my coffee outside accouterments, camera, and tools. When camping, I’d put in a front lowrider rack and panniers. Is coffee outside better alone, or with friends? This is a tough one. As much as I love riding with friends, I also love riding solo. I can meander more freely because I’m on my own pace and I love the convenience it affords, since it involves little to no planning. Sometimes I would ride out my front door and just make up my route along the way. What question did I forget to ask you that I should have? What other types of riding do I do? I’m a mountain biker at heart and I mostly ride singletrack all throughout the summer when it’s too hot and humid for coffee outside. Cool write up! Jay is one of the most thoughtful generous cats I know. We wouldn’t have half the great photos we do without his help and he’s always up for low fuss adventure. Glad he’s featured somewhere new! I loved reading this. Two things come to mind. 1. I love my Aeropress. I have 50 ways to make coffee, but this one is my favorite. 2. I think it’s important to have coffee outdoors — if you are on a crappy department store bike with an old thermos or on a fancy camping bike with a titanium cup — the difference is minimal. The important thing is to get out from under the roof of Starbucks and out into nature with your cup, a book, and a friend.